More price news as Moran Yacht & Ship changes the asking price of the 78.5m motor yacht Madsummer from Euros to US dollars. Launched by Lürssen in 2008 to a barrage of superlatives from the yachting press, this superyacht was designed by the fabled Espen Øino, with an interior by Alberto Pinto. Madsummer was designed to entertain a large number of guests with plenty of space for different salons, dining and relaxation areas. The dedicated spa area expands onto a large fold-down sea terrace which allows the guests to go from a swim to the sauna, on to massage treatments and to the hammam and inside/outside gym activities, all in a matter of seconds. She has an array of special features including a very large owner’s deck with its own jacuzzi and sunbathing areas, and a helipad which also incorporates a fuelling station. 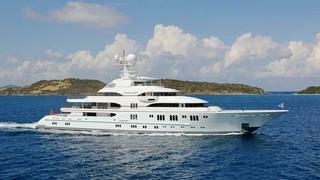 Previously priced at €135 million, she's now asking $179.5 million. Madsummer was a finalist at the World Superyacht Awards 2009, and features in the 2010 edition of The Superyachts book.